So excited to have Sara here from The Aqua House again today. Especially because she has created some insanely cute Christmas pillows, just in time for you to add to your holiday decor. And the best part? They’re quick and really simple to make. Plus, they add that perfect touch of holiday cheer to couches, arm chairs, beds, or wherever! 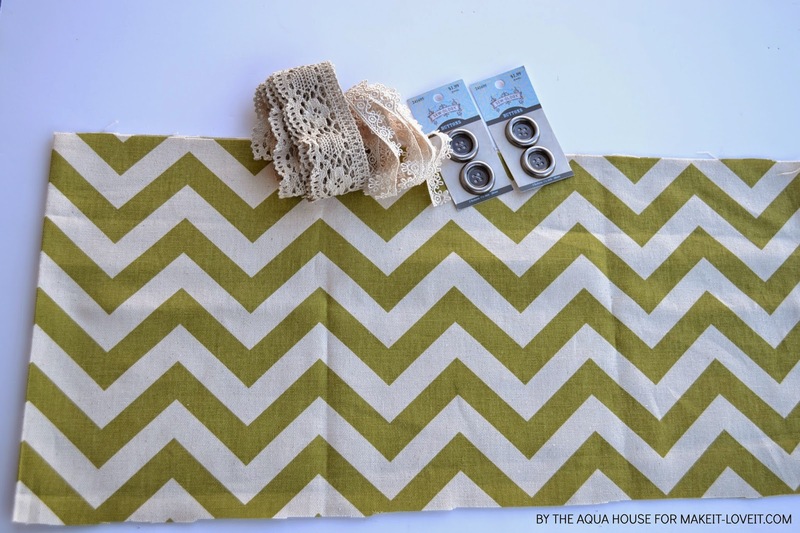 Hey guys, its Sara from The Aqua House and I’m here today to share with you two simple Christmas pillows! If your holidays are anything like mine, then your schedule is jam packed with activities, baking, and shopping! So for those of you who don’t have much extra time this holiday season for sewing and crafting, I created these super quick (as in you can get them both done before you finish watching your favorite Christmas movie) pillows. It won’t take you long at all to whip these pillows up and toss them onto your sofa, to add a little Christmas cheer to your home. The best part is that because they are so simple, you don’t have a ton of supplies to buy… and you might even have most of what you need on hand. These pillows would be fabulous to display in your own home, or if you are the type that likes to give homemade gifts, you can make some for a friend! Are you ready to make some Christmas pillows? Have you seen these black and white stamped pillows popping up in home decor? I first came across one last summer at a design center and fell in love. The concept of this pillow is so simple and that’s what makes it beautiful. The color combinations for this pillow are endless…stamp in red, green, silver, or gold…or have your background be a more festive color…really, it’s all up to you! Same goes for what you actually stamp on the pillow. I had a hard time deciding just what I wanted my pillow to say because there are so many possibilities: Fa,la,la,la,la, Jingle Bells, Merry Christmas, Silent Night, and so on! Don’t have stamps? Use iron-on vinyl! There are so many possibilities with this pillow. Whatever you decide for your pillow, here are the basic instructions for making your own hand stamped pillow. 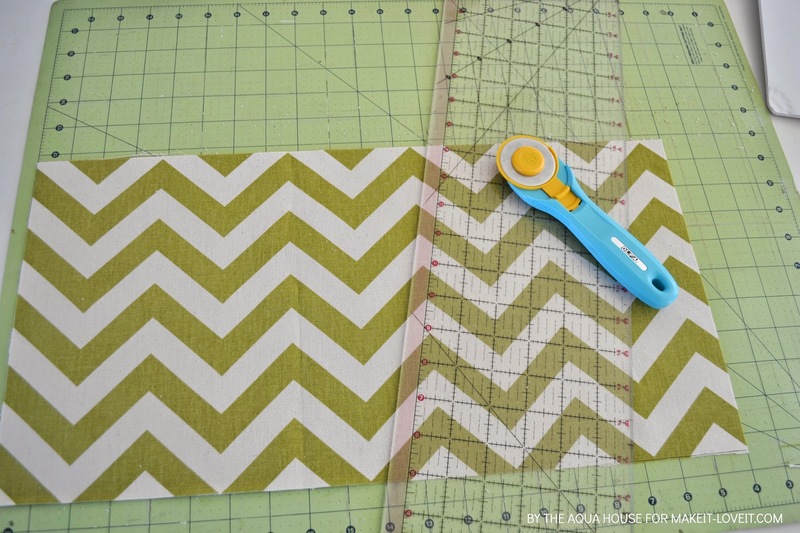 Lay out one of your 18 1/2 inch square pieces of fabric. Make sure your front and back piece aren’t stacked together as the paint could bleed through. 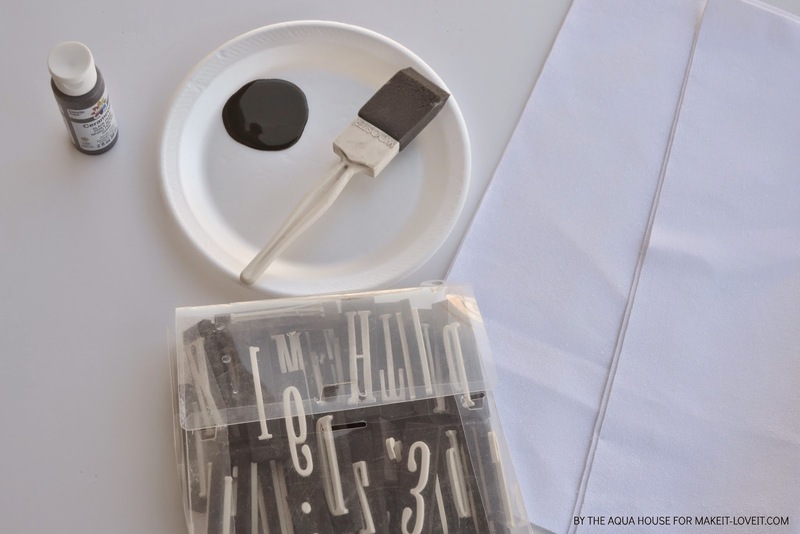 Take your first stamp and using the foam paint brush, carefully paint a small amount onto the stamp. It really takes only a little bit of paint! Take extra care not to have any paint get onto the sides of the stamp and make sure that all the paint is evenly distributed. You may even want to take a few test stamps on a scrap of fabric so you know what is a good amount of paint to use. 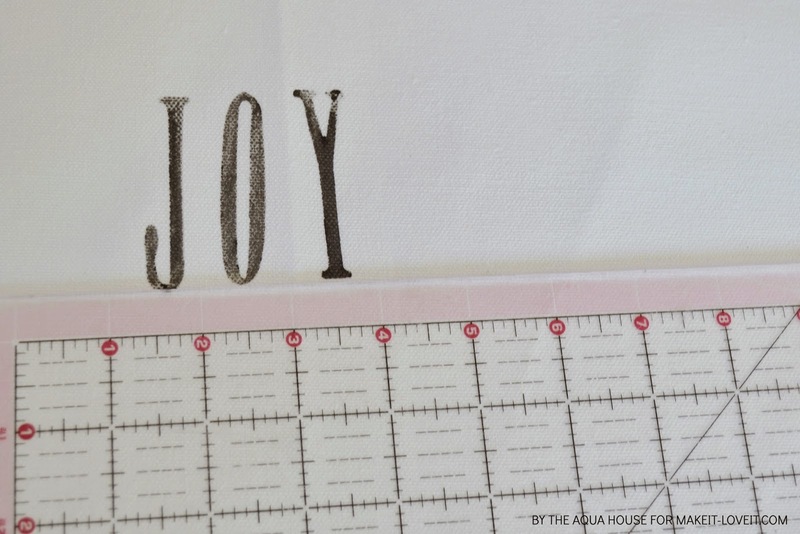 Next, place a ruler out square against the side of your fabric so you can keep your letters somewhat aligned. However, part of the originality and charm of a hand stamped pillow is that the letters won’t be exactly even and that’s ok! 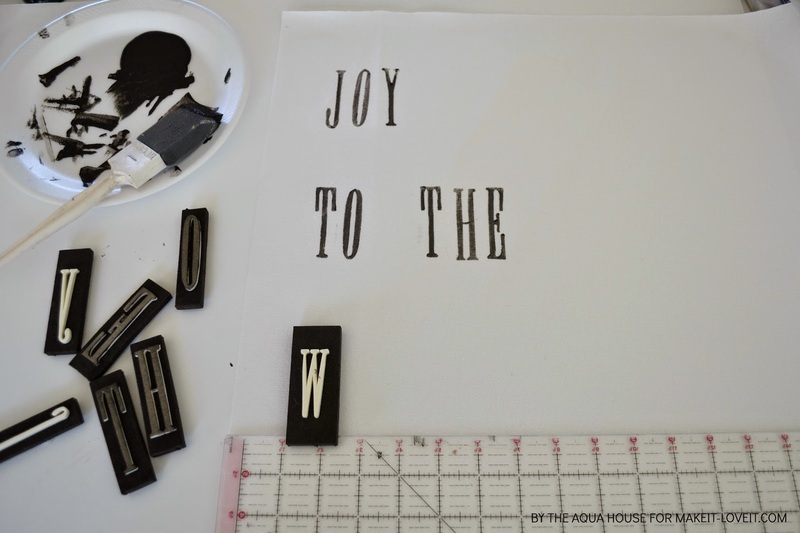 After the first row of words is stamped, measure down 5 inches and start stamping your next row. If you use 3 inch stamps like I did, this will leave 2 inches between each row of words. After you are done stamping, set the pillow top somewhere out of the way to dry. I let my pillow top dry for an hour before I sewed it to the pillow back. I wanted to make sure that the top was completely dry before I set it against the other piece of fabric. 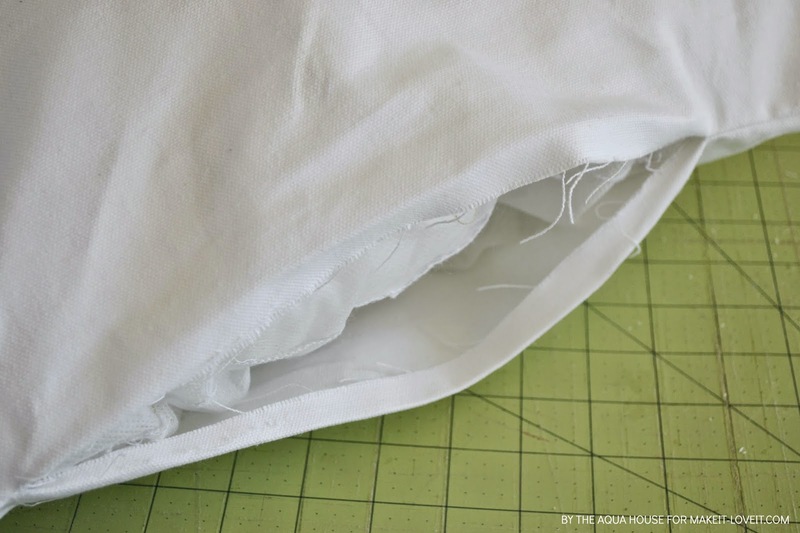 When the pillow top is dry, place it right side down against the pillow back (so that right sides are together) and pin them together, leaving an opening at the bottom for your pillow form or fiberfill. 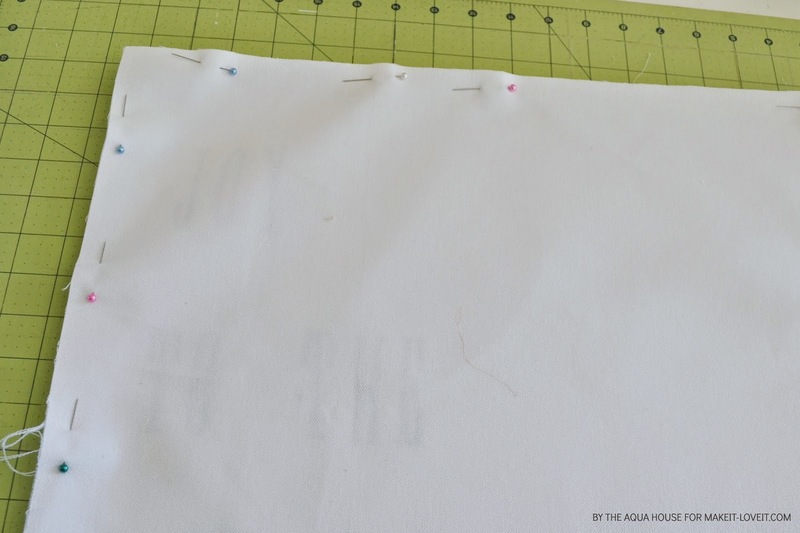 Sew around the fabric, using a 1/4 inch seam allowance. 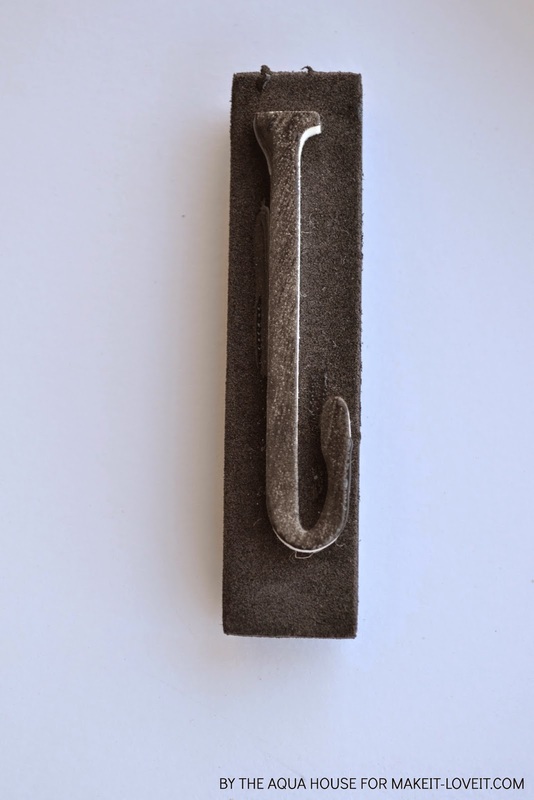 Turn your pillow right side out and press the opening towards the inside, 1/4 inch. These fun little Christmas trees were such a breeze to make! Just like with the hand stamped pillow, there are so many ways you could adjust this pillow to fit your exact needs. You could use ribbons instead of lace and stack the ribbons closer together. Or if you don’t like the abstract look, you could easily trim the lace down at an angle along each edge, so the trees look more triangular. And star buttons at the top would be a perfect addition! Here is what you will need for this project. Take one of the 10 inch by 20 inch rectangles and lay it out flat in front of you, right side facing up. Grab your 2 different types of lace and cut 3 pieces from each type, into 5 inch long pieces. 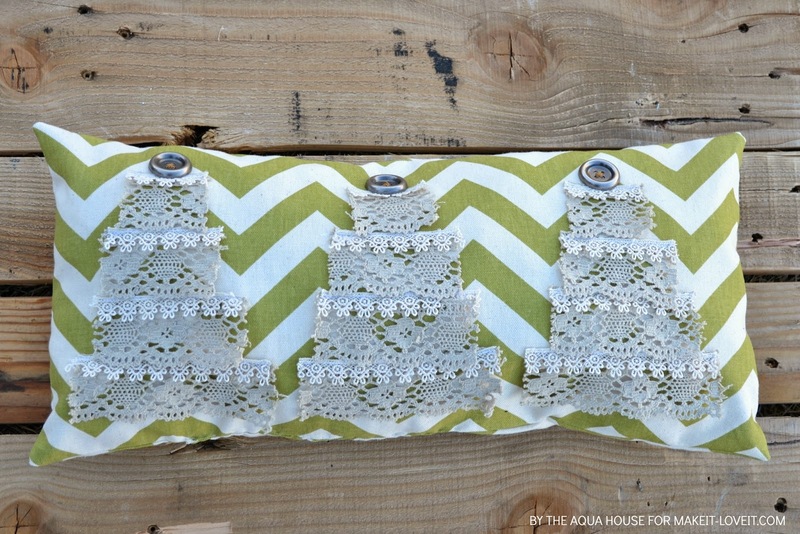 Stack the lace onto the pillow spacing them 1/2 inch apart horizontally. I stacked my lace together so that I only had to sew across the top of the two pieces once to attach them. Pin the lace into place and sew across using a matching thread color. You will repeat this step with each row of lace. 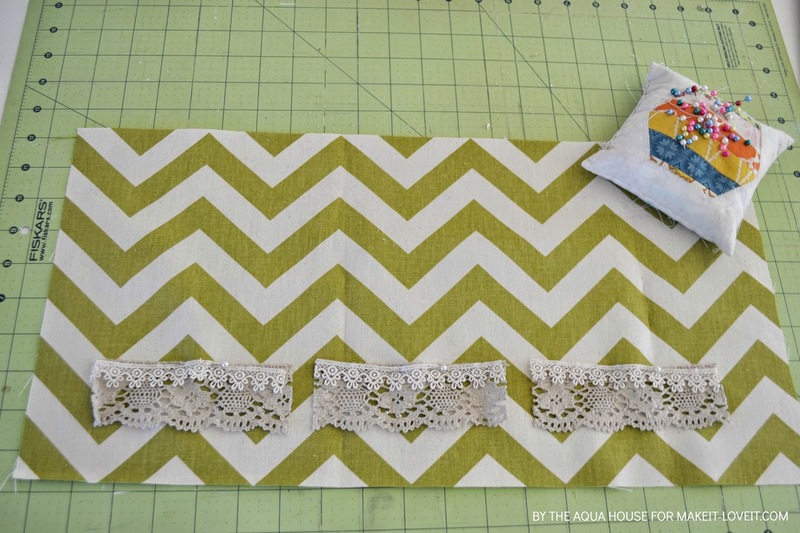 For your next rows of lace, you will cut it at 4 inches, then 3 inches, and the top row will only be 2 inches. Sew each row on, centered above the previous row. 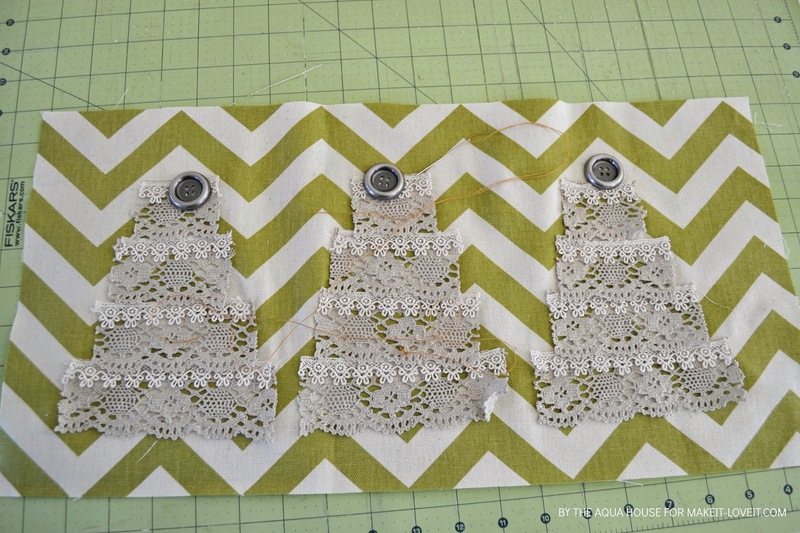 If you want your trees to be more triangular, I suggest that you lay out all of your rows of lace before sewing them to the pillow and use a ruler and rotary cutter to cut it into a triangular shape. Then attach the lace to the pillow. Center your buttons over your trees and hand stitch them into place. Now that your pillow front is finished, place it together with your back piece, right sides together and pin in place. 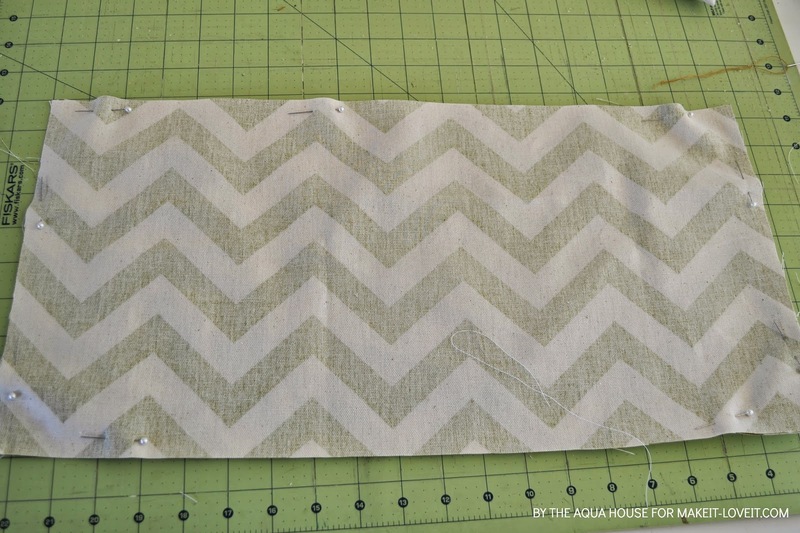 Sew them together, using a 1/4 inch seam allowance, leaving a space at the bottom to stuff the pillow. Stuff and hand stitch closed, just like the pillow above. So simple and done in no time at all! Now go toss them on your favorite sofa or wrap them up and take them to your friend down the street! They will make the perfect background accent for your holiday decor. What size pillow form do you recommend using? 18 in for the 18.5 fabric squares? Or a smaller pillow form?